This Nars concealer is my all time favourite, so it’s more than obvious that it’s an essential to my handbag makeup bag. For days when I’m out for a long period of time, or when I’m in work and have plans afterwards, this is what I use to refresh my makeup. I’ve never found it to appear cakey on the skin, it’s so smooth and lightens up any area of my face. I use this under my eyes for any dark circles, and around my nose. I’ve occasionally dotted and blended a small amount on the forehead in order to brighten my complexion. Considering I have oily skin, I never thought I’d like this concealer. However I’ve repurchased it repeatedly and I’m not sure I could leave the house without it. On days when I have plans of the evening and plans during the day. I like to keep both a bright and a neutral lipstick in my makeup bag. A good lipstick can do wonders in changing the way you look and feel. This lipstick is such a bold red with orange undertones. When your look needs updating for the evening, this is usually what I reach for. It’s a really creamy formula, considering that it’s a matte lipstick, it would last pretty much all day and night with very few top ups. I’ve spoken about this lipstick previously on my blog and to this day it’s a complete essential. It’s a really beautiful mauve pink. Similarly to the Mac lipstick, it’s a really creamy matte lipstick. It doesn’t feel heavy on the lips. Therefore it’s a good lipstick for the day time, you’re not conscious of it, it has a really weightless feel about it. It’s the neutral lipstick that I’m forever chucking into my handbag when I’m in a rush and I know it’s going to be a long day! 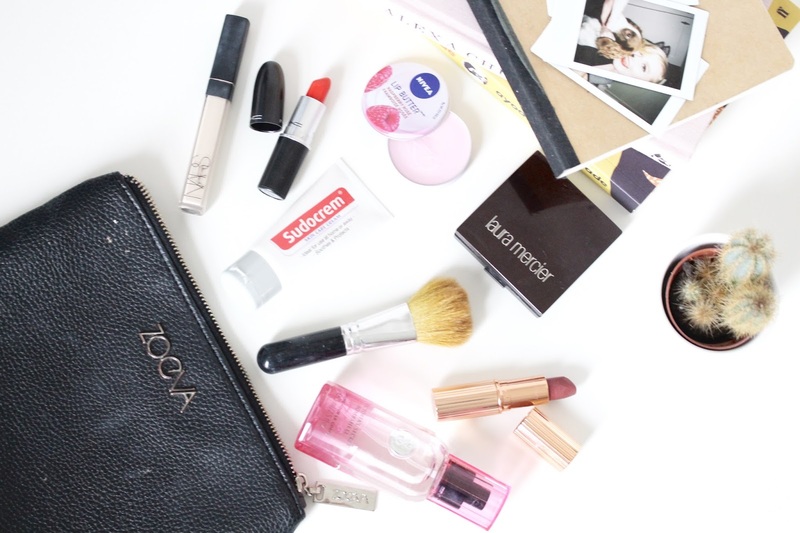 The number one essential to any handbag has to be a lip balm, especially during the autumn and winter months. I usually opt for my carmex the second that they become chapped. However I’ve been loving this Nivea lip butter recently. It’s smells like sweets and is a great alternative for a lipstick during the day. The fact that it’s in a tin means that it’s not going to open in your bag, or get majorly damaged, which is always good when your bag is overloaded with uni books! This is a multi-use skin cream, in can be used for pretty much anything! I take this product around when I’m staying overnight somewhere and I’m unable to take my entire skin care routine. it can be used as a spot treatment and a moisturiser. I’ve even used it as a hand cream when I’ve been out and about. The cream comes in a really handy small tube, so it doesn’t take up to much room in your bag. The cream is thick and really moisturising, as it contains zinc oxide, which helps in preventing moisture loss. So when the cold weather begins to take its toll, this is definitely going to be a product that I’ll be ensuring I have with me at all times! If you have sensitive skin like me, sudocrem is a brilliant brand to opt for. A powder is a must have to any bag when you’re out and about. The Laura Mercier Matte Translucent powder is one of my all time favourites. It’s a really sturdy compact, which includes a mirror and a sponge, so topping up on the go isn’t an issue. The powder has a really silky texture and I find my makeup staying power is elongated when I set my foundation and concealer with it. However my skin is combination/oily, so it’s really essential for me to carry around a powder when I’m out for the day! I can’t say this is my favourite scent and that’s why I carry it around. I simply carry it because the packaging is really convenient. The scent is quite floral however it has quite a heavy musky undertone – Yes I’m really bad at describing scents. However it smells nice enough for me to wear, so I think that says it all. The body mist is affordable, so I don’t mind using it to spritz myself up throughout the day. I usually apply a perfume in the morning, however some of my uni days start at 5am, so by the afternoon, the perfume is barely recognisable. So it’s always good for me to have something handy! I’ve had this brush for quite some time now, and it goes practically everywhere with me. I occasionally carry around a few more makeup items like bronzer, if I know I have evening plans, or simply just need a top up. This brush has a really small handle which makes it really easy to carry around in a small bag. I tend to take this brush out on night out, as it fits into my clutch bags really easily and takes up next to no room! I hope you enjoyed this blog post! I thought I’d do a bonus blog post this week! I think it's a tad awkward to open, however I find that type of packaging to be a lot more sturdy! I love bond girl! It's pricey but it's worth it, I've got mine last year and I'm still obsessed with it! They smell amazing don't they! Me too! My all time favourite!